To read the insights for last week's study, scroll to the bottom of the page HERE. Although Esau failed the marshmallow test (as I previously wrote), he did something very godly later in life. Esau had more reasons to hate Jacob than Jacob had to hate Esau. But in Genesis 33, when Jacob returns unannounced to his homeland, Scripture says: "Esau ran to meet Jacob and embraced him; he threw his arms around his neck and kissed him. And they wept." (v.4). And when Jacob tried to bribe him with gifts, Esau said, “I already have plenty, my brother. Keep what you have for yourself” (v.9). Esau was content and forgiving,(2) and he wanted to restore his relationship with Jacob. Do you need to do likewise in any of your relationships? (1) God promised Jacob favor, but Jacob and his mother took matters into their own hands and tried to "steal" favor before God gave it. (2) Nothing we know about Esau's life is godly except this one incident, but it's an important one. Reconciliation is not possible unless both parties are willing, but each of us must carefully examine our hearts when a relationship is broken. 1. Have you ever had a family member who deceived you and/or mistreated you? Do you find any comfort or help in the following Scriptures? Obviously, we cannot reconcile with anyone who is unwilling, but it's important that we learn to be content and forgiving. Philippians 4:12-13: I know what it is to be in need, and I know what it is to have plenty. I have learned the secret of being content in any and every situation, whether well fed or hungry, whether living in plenty or in want. 13 I can do all this through him who gives me strength. 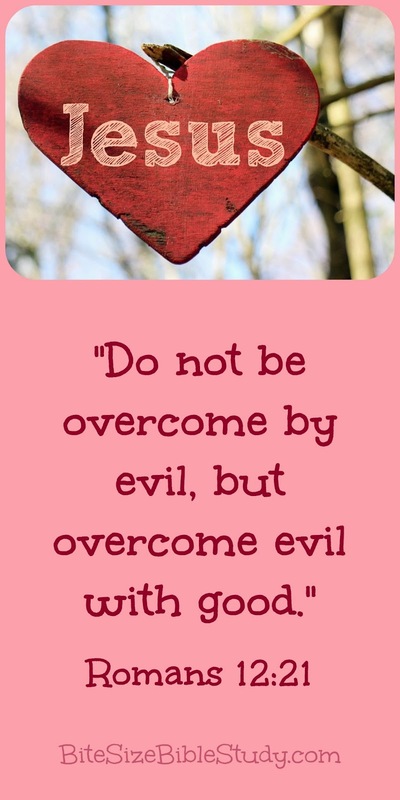 Romans 12:17-21: Do not repay anyone evil for evil. Be careful to do what is right in the eyes of everyone. 18 If it is possible, as far as it depends on you, live at peace with everyone. 19 Do not take revenge, my dear friends, but leave room for God’s wrath, for it is written: “It is mine to avenge; I will repay,” says the Lord. 20 On the contrary: “If your enemy is hungry, feed him; if he is thirsty, give him something to drink. In doing this, you will heap burning coals on his head.” 21 Do not be overcome by evil, but overcome evil with good. Some people are naturally are more contented than others, but our faith should lead to contentment. After all, we have the most important thing in life and in death--Jesus. Everything else pales in significance. In addition, we understand that God works even the worst of circumstances to our good if we love Him (Romans 8:28).